The statistic shows the unemployment rate in selected world regions between 2015 and 2017. In 2017, the unemployment rate in the Arab World was estimated to have been at 9.93 percent. Following the global financial crisis in 2008, unemployment saw considerable downturns around the globe, most notably in 2009. Unemployment rates, despite experiencing dramatic improvements over the years following the crisis, still have not reached pre-2009 levels for the large majority of countries. The same trend is followed with unemployment among the youth between the ages of 15 and 24, around the world. Many youth experienced layoffs after 2008, mainly because their skills were interchangeable and easily replaceable and as a result, youth unemployment increased, although the situation has improved slightly. 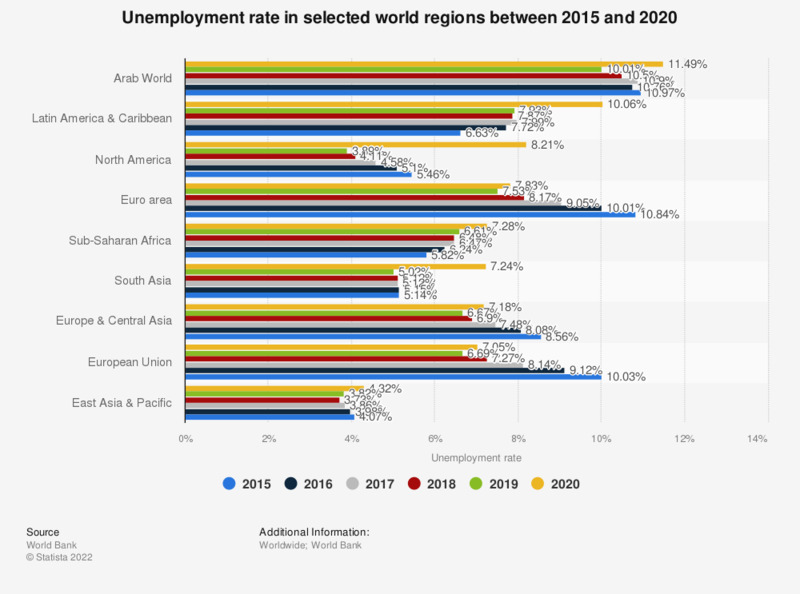 The unemployment rate in selected world regions remained relatively stagnant year-over-year from 2012 to 2013, however is expected to improve over the long run based on current employment trends. Economic improvement around the world is primarily evident from growth of real gross domestic product , which has been relatively positive in most countries with the exception of those in the euro area. Growth of real gross domestic product points to economic growth as well as a higher productivity within each country. On the other hand, other indicators of economic health, such as inflation, point to further economic distraught, as inflation is expected to increase globally, most prominently in non-developed countries.